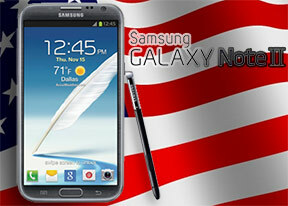 The Samsung Galaxy Note II comes with a brand new, eye-candy rich Gallery app. It opens up in Albums view, but photos can also be sorted by Location, Time, Person (photos with tagged faces), Group and Favorites. You can also switch between three view modes - rectangular grid, a grid that's spread out in 3D space and a 3D spiral (which is the least useful of all). In each of the three view modes, you can pinch zoom to make the thumbnails bigger. Unlike Sony's gallery, you only get two zoom levels here. Getting inside an album, the app switches into a split screen mode. The left side shows the folders, while the right displays all the photos in a rectangular grid. You can also use Air View to take a peek at what's inside a folder without opening it. When viewing a single photo, you'll find Star, Share and Delete buttons above the photo, while below is a line of small thumbnails of all other photos in the album. You can tap those small thumbnails to move to other images or you can just swipe to the side. We also found that unlike other droids, the Galaxy Note II lets you select folders from several different folders for batch operations. The list of features goes on. There are a couple of photo editing options and a crop tool. You can add an image note by scribbling over it with the S Pen (or your finger) and this is not damaging the image. Contextual tags display labels with the location, who's in the photo and the date (if there's a GPS tag and you've taught the Note II about what your friends look like). Then there's the print option, so you can print out photos without going through a computer first (but you'll need a Samsung printer). When viewing a photo with people's faces in it, the Galaxy Note II will try to detect them automatically (and you can manually highlight faces where it fails). Buddy photo share will use your contacts' profiles to try and recognize who is who automatically. Another option allows you to OCR a photo and copy the text. This is very handy if you often work with documents but don't have a scanner and a computer handy. And if you thought that Samsung didn't include the kitchen sink, the option to add weather tags to a photo (a feature courtesy of AccuWeather) should change your mind. We still can't figure out what the use for that may be. The Samsung Galaxy Note II uses an updated version of the TouchWiz music player. Samsung has enabled equalizer presets (including a custom one) along with the sound-enhancing SoundAlive technology, which features 7.1 channel virtualization. Samsung uses SoundAlive in some of their MP3 and Android-powered media players. The Galaxy Note II player is DLNA-enabled, so you're not limited to tracks on your handset - songs on devices connected to your Wi-Fi network are as easy to get to as locally stored songs. Samsung have put what is easily the best default video player on the Samsung Galaxy Note II. It offers several view modes - grid, list, folders and nearby devices (which accesses DLNA devices). The grid view is our favorite as it is a true quad-core tour de force - the visible video thumbnails (all eight of them) are actually playing the videos instead of being static images. They play at a reduced framerate and generating those previews takes a couple of minutes the first time around, but it's an awesome preview and it shows what can be done when you have processing power to spare. The video player lets you squeeze the best viewing experience out of the large, high-res screen. You can adjust video brightness, color tone and enable outdoor visibility too. Another cool feature that showcases the power of the Exynos chipset is the chapter preview - it detects chapters in the video and shows a rectangular grid, with live thumbnails (just like the grid view above). The video player had absolutely no trouble with any of the files we threw at it - starting with .WMV, through .AVI (DivX and XviD) and .MP4 to .MKV (H.264). Resolution wasn't a problem either - the Samsung Galaxy Note II played FullHD files. Large files worked seamlessly. The Samsung Galaxy Note II also made a good impression when it offered a list of subtitles and let us pick. It scans for all subtitles, so the file doesn't have to have the same name as the video file. The video player on the Note II has a feature called Pop up play - it moves the video in a small floating window and you can use other apps on the phone while still watching the video. You can use pinch zoom to adjust the size of the video. The Samsung Galaxy Note II obviously shares many of its music playback-related internals with the Galaxy S III as it managed to aced our audio quality test in a similar manner to its more compact sibling. 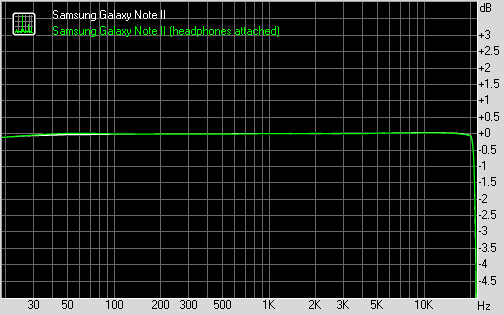 The only average volume levels aside, the Galaxy Note II results came out perfect in the first part of our test. When connected to an active external amplifier, the phablet produces excellently clean output with no weak points whatsoever. Even more impressively, stereo crosstalk is the only thing to get damaged when we plugged in a pair of headphones. On that occasion the Note II produced one of the cleanest outputs we have seen from a mobile device and that includes the recently tested Apple iPhone 5. The higher volume levels of iOS flagship would probably still make it a slightly better option for audiophiles, though.